In a non-stick pan, sauté onion in vegetable oil until translucent over low – medium heat. Add carrots, stir and cook for another minute. 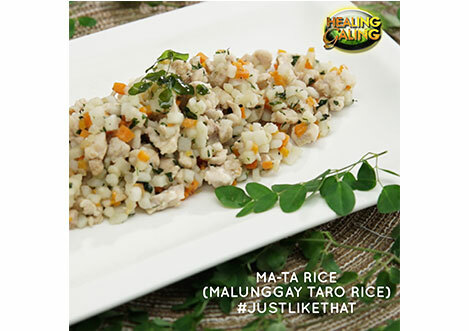 Toss in par-boiled taro and mix in malunggay leaves. Cook for a minute over the same heat. Turn off the heat and season accordingly with seaweed salt and pepper. Adjust to your own taste. Set aside. Pan fry marinated chicken in a separate non-stick pan until thoroughly cooked. Serve the matarice on top of your mock tocino. Drizzle with honey on the side and garnish with fried malunggay leaves on top.